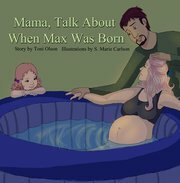 When I was first asked to review the adorable book, “Mama, Talk About When Max Was Born,” I scrolled quickly through the pages and thought sure, it’s certainly cute. Then Zon looked over my shoulder and wanted me to read it to her. As I took my time looking at the pages and pointing out various details with my toddler, I became very impressed. This book manages to incorporate little details that are important to homebirthing, waterbirthing families. It shows a family-centered water birth attended with a midwife and doula. It tells the story of a little girl's brother, Max, and how he was born. A mother, father, daughter, Nana, midwife and doula are included in the story. I especially liked seeing the little girl in every scene, looking happy and included in a variety of circumstances, such as prenatal visits and setting up the birth pool. As an unassisted birthing mama, I was still comfortable with the prenatal scenes. They showed gentle care of the mama without a doppler or other invasive testing. Every scene of the birth is calm, hopeful and upbeat, with smiling attendants and a glowing mother in labor. The father is present and engaged. The scenes are drawn invitingly and colorfully, with an eye for detail. After the birth, the mother is shown nursing her unwrapped baby. No baby burrito! I have to admit; I had a little tear in my eye at the end. :) I hope Zone and Ian are present when the next baby arrives! You can get your own copy at www.talkaboutmax.com.